There are number of fine Thai restaurants in Dubai which are special in their own way, but what makes Lemongrass Restaurant is that this is the only Thai eatery that does not add artificial enhancement in any of their dish. In contrast to this restaurant, others add Monosodium Glutamate (MSG) in their dishes to boost flavours and aroma which is not healthy. This contemporary Thai restaurant allures people with the original essence and true taste of its Thai dishes that is tangy, spicy, sour and sweet. In addition to this, friendly staff, elegant decor and cozy seating arrangement of Lemongrass Restaurant raise its eminence even more. It is because of these fine attributes, Lemongrass Restaurant has been able to become such a hit concept. Authentic Thai and South East Asian fares are included in the menu of this restaurant that has its branches in various areas of Dubai. Guests will find delicacies like noodles, rice, curries, seafood items along with some crab and lobster options. Alcohol is available at this venue and guests can also take outdoor seating if the weather is pleasant. Take away service is also available and lot of people avail it to carry out food for friends or family members. To view the complete menu of Lemongrass Restaurant, click here! Opening hours of Lemongrass Restaurant branch next to Lamcy Plaza are from 12:00 noon to 11:30 pm and it opens daily. 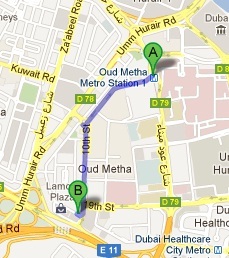 Next to Lamcy Plaza, Oud Metha, Dubai, United Arab Emirates. Head southwest on 10th Street after coming out of this metro station, then at the roundabout take the second exit and stay on 10th Street. After that turn right onto 4th Street, where destination is located and can be easily spotted on the right side. Lamcy Plaza – Dubai bus stop is just 95 meters away from the Lemongrass Restaurant, which makes it hardly 1 minute walking journey. A bus user needs to take any of these bus numbers 42, 44, CC4 and C18 to arrive at Lamcy Plaza – Dubai bus stop and then head in the southeast direction on 4th Street, where destination is situated on the left side. Checkout map for directions.